Scientists who study wild animals want to get as close as possible to their subjects without stressing them out or disrupting their natural behaviors. One possible solution: remote-controlled rovers. In a new study, Yvon Le Maho of the University of Strasbourg in France and colleagues equipped 34 king penguins with an external heart rate monitor that could be read with an RFID antenna (the same technology lets you into your office or onto the subway with the swipe of a card). A day later, they sent an unadorned 4-wheeled rover into the colony. Not only did the penguins let the rover get close enough to read their monitors, the birds’ heart rates increased less and returned to normal more quickly than when the same task was done by a human with a hand-held reader. 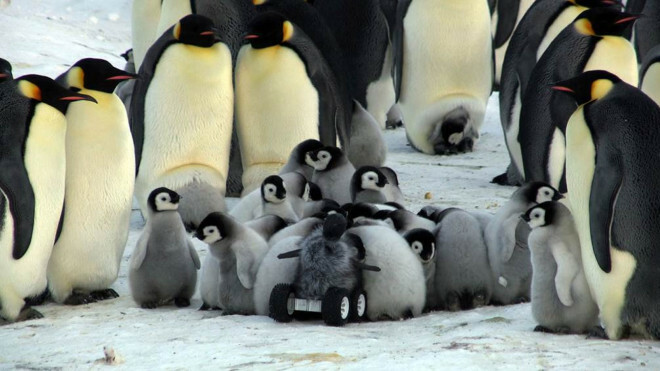 Le Maho is already using the rovers to study how climate change is affecting the breeding success and survival of king penguins. But he and his colleagues say there are many other possibilities. The rovers could be modified, for example, to record vocalizations of animals or to gather data from sensors mounted inside their territory without disturbing them. This fits with what I've heard previously - that animals often ignore robots perhaps because they can see they are not living creatures. Although on the other hand we've all probably seen a video or two of a bird attacking a multicopter. I guess the robot being small is also good. I think they mistake it for grandmama on her mobility scooter, hence the young'uns give it attention and the grown-ups are wondering why the Alzheimers set in so quickly.